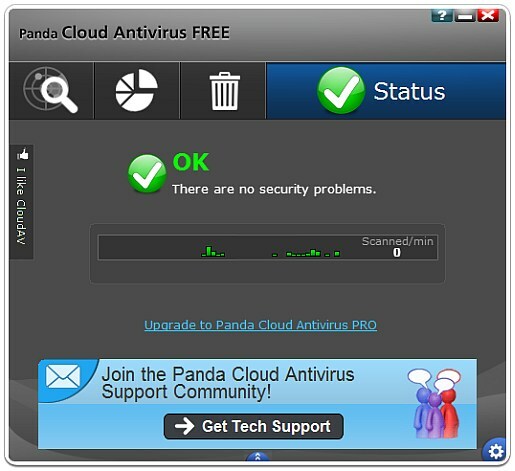 Panda Security has released Panda Cloud Antivirus 1.5 as an upgrade to 1.4. The software includes a lot of notable fixes, including faster scanning speeds, even lower resource usage, more advanced configuration options and more. We will be comparing these updated claims to our test’s from the 1.4 versions. Also, Panda Cloud antivirus remains our antivirus of choice due to its light weight and detection effectiveness, on all of our non test systems. If you have the previous version installed, it will automatically update to 1.5. We received the upgrade today. The installation of Cloud Antivirus 1.5 has been completely revamped. Rather than an older formatted window uncompressing all the files, there is a new sleek interface. In the advanced options there is the option to installer the panda security toolbar and customize the installation location. The installation finished in about 1 minute and offers to install the free or pro version. Continuing, with the light weight theme, the download is small at 694 KB which is an increase of 301 KB from the previous version. New on the main screen is a graph depicting the scanned files per minute. This is a handy to indicate the antivirus’s status. The main icons have also been redesigned. The scan options remain the same, optimized, scan my computer, and custom locations. Scanning speed has increased from 3 megabytes per second to about 5 megabytes per second. The scanning time has improved from 20 minutes to about 15 minutes (even considering the increased amount of files on the test system). The optimized scan didn’t detect any malware during the scan. However, the most frequently detected items are cookies (double click) type on the other systems running the antivirus. A quick security test to attempt to shutdown the process via task manager resulted in an access denied message. This means that viruses will have difficultly shutting down the process. Heading over to the advanced menu shows several improvements that panda security has added. New are the detection of potentially unwanted programs, the option to scan compressed files in on demand scans, and a background scanning after cache synchronization (not exactly clear what this feature actually does). There is also now the option to generate advanced logs. In the exclusion area one can exclude files and also whole folders from being scanned. As far as resource usage goes. Panda Cloud Antivirus went from using one megabyte to now only 328 to 401 kilobytes when idle. This is extremely small and complements to Panda Security for achieving this. Scanning sees memory usage remain about the same as previous versions. Finally, it appears that the changes from 1.4 to 1.5 are relatively minor but appreciated. Cloud antivirus remains one of the lightest if not the lightest antivirus available online. Not to mention, that the antivirus is completely free. There is now a built-in like system for Facebook and Twitter. I would encourage spreading the word about cloud antivirus, as it is truly a great antivirus program.